The deputies were excited but quiet about it, out of respect for Peach. Unexplained death was uncommon, even with the aging residents that made up much of the population of the town. Violent death was even rarer in the scattered villages that lined the one road in and out of the mountain towns, and news about it would spread quickly. Meth, heroin, domestic abuse, identity theft, yes. At this point, though, murder seemed unlikely. Holly got Peach settled with a cup of chamomile tea and a plate of Fig Newtons along with a promise to stay put. It was hard to ignore the blood that stained her black-and-white cotton top. It’s my birthday! Well, not mine per se, but that of Destination Mystery. I launched the podcast two years ago, and in honor of that momentous event, I give you a bonus interview this month. My dear friend and wonderful mystery writer, Mar Preston, chats with me about her terrific police series, one set in Santa Monica, the other in a mountain village — proving that crime is everywhere. 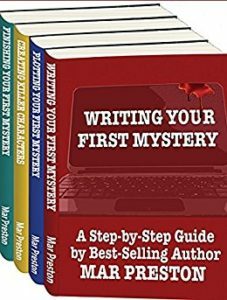 Mar also writes books for beginning mystery writers, and you can get the first one for free, just by visiting her website and scrolling down. As always, if you’d rather read than listen, there’s a transcript below. Enjoy! And happy birthday to all of us! Laura Brennan: My guest today writes police procedurals set in idyllic towns — proving that even in paradise, murder is not unknown. Her Dave Mason mysteries take place in Santa Monica, where sun and sand are no match for greed and ambition, while her Dex Stafford series is set in a mountain resort community suspiciously like the one she currently calls home. Mar, thank you for joining me. Mar Preston: It’s a pleasure. I enjoy talking to you when I see you at mystery conferences. This is a treat! LB: It is! It is. I’ve known you for years I’ve loved your writing all that time. LB: So let’s talk a little bit about how you got into writing. When you started, you weren’t writing mysteries, you are writing something else, right? MP: Well, I’ve always been a wordsmith. And I thought because it came easily to me that anybody could write if they just put their mind to it. It wasn’t a skill that I thought had much value. And because I worked in academic research, and numbers and charts and graphs — that was what was important. And then, after a long illness, as they say, my husband died and I’d been involved in taking care of him for a long while. When he died, there was this great gap of time. What was I going to do for myself? I had moved to this small town, this village, where I only knew a few people, and this time stretched before me. Not to say that I’d never done any writing, but my ambitions were literary fiction. And I had produced four unpublishable novels. No one wanted them. And I think back on them and I shudder. But, you know Laura, I taught myself how to write in those novels. So when this time appeared before me, I thought, well, I’ve always loved mysteries. I could never get enough. And, well, I’ll just write a mystery. That’s what I’ll do. It can’t be that hard. Well, I laugh at myself now — and other mystery writers will laugh, too, hearing that. I set myself to write about a place where I’d lived, which was Santa Monica, by the sea. In the first one came relatively easily. I based it on a political campaign that I had, my heart was in. And we lost. And I wrote about that, disguising it as a casino campaign where casino behemoths want to move into Santa Monica and build a high-rise on the shore. If you know anything about liberal Santa Monica, that was not going to happen. So it had lots of conflict and I’ve been watching police for a long time. I’ve never wanted to be a cop or date a cop or marry a cop, but I was interested in the work. And so he became my fictional hero, Dave Mason. And since I was kind of a civic gadfly myself, I decided the love interest was going to be his activist girlfriend. So that was my first novel, No Dice. 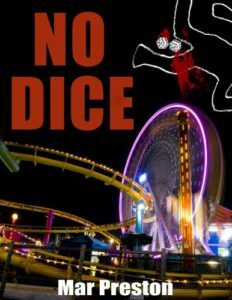 LB: Well, that’s interesting because in fact when I read No Dice, it feels two things: first, it feels like a very personal book. There’s a lot of things that ring so true, especially with the community activist and with the politicians. I believe you use the word shenanigans at some point for it. So I’m not surprised to hear that you lived through something similar. MP: Yes. I sat through many a City Council meeting and finally all that boredom and all that conflict came into usefulness when I wrote that book. And in the other series that I write as well, here in this little mountain town in California, the politics aren’t quite on as large a scale, but oh my people can be nasty! And rant and rave at meetings. So I observe all that and it somehow sneaks into my writing. Politics are interesting. And so is money; money is very interesting! Especially as it intersects with politics. LB: I want to stick with No Dice just for a minute. You chose to write a police procedural because you were fascinated by the police; you actually took a course with the Santa Monica Police Department didn’t you? MP: It was the first of many courses that I’ve insinuated myself into to learn about police and law enforcement in general. I go yearly to a conference called Public Safety Writers Association. That’s in Las Vegas, and that’s a gathering — oh, so interesting, Laura. You’d love it. It’s writers who write police procedurals and law enforcement, firefighters, and EMT people. And all of those people, they have wonderful stories but they’re not good writers. And they’re learning to be better writers. It’s a combination of what they call a craft conference, in which there’s a lot of how-to, and for the writers, the people who have lived the life and lived those stories talk about them. You learn about, oh, SWAT tactics, there’s usually CIA people there — they don’t talk much. And FBI and EMT and also dispatchers, and they all have terrific stories. And then I went to Writers Police Academy which is set up by a retired cop called Lee Lofland. And if you have any yen to write police procedurals, there are a lot of interesting varieties of experiences you can have with people who do them professionally. I think the first one you mentioned is something that’s available to a lot of people and it’s called this Citizen Academy. You can call your police station and see if they offer it where you live. It’s a look behind the blue curtain, that’s what it is. There were 13 sessions, and like the Writers Police Academy, we heard from jailers, we got to visit the jail, and one other Rhodes scholar experience I had, I got to visit the morgue. And, you know, if I sit quietly with myself, I can still smell it years later. So all of these things go to give me and anyone else is interested as I am in making it authentic, there are a variety of places you can do that. Also, you can make friends with your local cops. They have great stories and they like talking to people. LB: One of the things that so real in your novels is the personal lives of your detectives. Everyone has emotional issues, baggage, problems that they’re working out and working through. And those personal demons bleed into the investigation. MP: Oh, I’m sure that’s true. It’s fiction for me, but many people have said how authentic they are. You know, I’m just plain interested in people. I figure everybody’s got a good story and if you listen long enough and you asked the right questions, it’s astonishing what people will tell you if you keep your mouth shut and your ears open. Haven’t you found that? LB: Oh, absolutely. And it’s so funny that you should say that because one of the things I noted is that everybody, even the most minor character, has their own angle. They all have their own agenda, their own things that they care about. It makes it feel so real. MP: Well, I work hard at that, I guess. LB: No, I think it’s what you’re saying, too, about how curious you are about human beings. I think that really plays out well. LB: Okay, so, you told us a little bit about your first book, No Dice. But tell me a little bit about your detective, Dave Mason. Because he goes on to be featured in, so far, for of your novels. MP: That’s true, and now I’m finishing a fifth. Like many of the cops I’ve met, he’s a good guy. And he sees only too well what’s going on behind the blue curtain. And he hates what they call “lops,” which is a lazy cop. He struggles with what goes on. Santa Monica, long ago, was — the first person to write about it was Raymond Chandler, did you know that? He called it Bay City, and even then it was known as a center of corruption and crime. And it’s perhaps less so nowadays. The Santa Monica Police Department has a very good reputation — I can’t say that unilaterally because there are people in town who charge it with the usual things about brutality and indifference. There’s a huge homeless population; everybody loves the seashore and the sand and the sunshine. So there’s a huge population of homeless people. It’s a liberal city that has devoted a lot of resources to trying to find ways to get people into housing and off the street, but there’s always more. Always, always more. And I had one of the community services officers tell me, well, the homeless people are the cause of all the crime. I don’t think that’s really true. But it’s certainly a way that the social problems that are at the fore in Santa Monica come about. And Dave Mason sees at all. But his social activist girlfriend, Ginger, she presents to him another face of it and he can’t help technology that that is there, too. So he has a complex, layer view of crime in Santa Monica and because he lives in the city, he’s able to see how the police are seen and actually to grimace sometimes. I wonder if I haven’t too rosy a view of cops and that I’ve written too much of a good guy. But I don’t think so. Because my experience is, cops know who the guy is they’re working with who ought to be chained up in the back of the station and they work around him. So Dave does have a complex view, and I like him. You know, he’s me, he’s all the cops I’ve met boil down into this guy who goes to work every day and sees the world pretty much as it is. LB: Yeah, he’s a great character. And then you decided to create a second series, and this one has both a detective and a patrol officer working together. And the patrol officer lives in a small mountain town much like the one you moved to. MP: What a surprise, huh? LB: What a shock. One of the things I really love about that is the tension that you’re able to capture between the security patrol that she is part of and the citizens of that small town where everybody knows everybody, but there’s still tension between the people they are going to protect and while they might protect them, they may not like them very much. MP: Well, some of the biggest things that the security patrol officer, by the name of Holly, has to handle our barking dogs and neighbor disputes. And she has only so much, very limited powers to help them. And the police, the actual Sheriff’s Department is 18 miles away. So if something goes wrong, there they are. And they have very limited powers. And now there’s this hotshot detective who comes from Bakersfield — and, boy, he considers Bakersfield the fast lane. And he comes up and he has a murder to deal with while she still got barking dogs and vandalism. Murder certainly trumps barking dogs, wouldn’t you say? So the tension between them is the slide into a very prickly alliance and then a romance. It’s something that I enjoyed writing and imagining. LB: One of the things that you say about Holly — or that she says about herself, actually — is that her job is actually to help people. While he may look at her as kind of a rent a cop, she takes great pride in actually helping people. MP: That’s something I heard from every cop, law enforcement, firefighter, EMT, security patrol, rent a cop, that was right across the board. It’s sort of a theme. People who go into law enforcement at the beginning, they truly do want to help people and make their little community better. But it’s what happens to them. It’s a brutalizing workplace. LB: That — it’s so discouraging to hear that! LB: I understand, though. I understand. Now, the citizens of the town also, their relationship — they don’t have much of a relationship with the detectives who just sort of come in, but they have ongoing relationships with Holly. She’s a member of their community. She brings them home when they’re too drunk to drive. But there’s also a tension there, there’s a resentment sometimes against her. MP: Well, she’s the one that’s telling you that you’re playing your music too loud and you’ve got to get out there and clean up your yard, the neighbors are complaining. And it’s very personal. She’s also involved in animal rescue, and that’s been a big theme in my life as I’ve lived it. She knows who the cat hoarders are and she knows who abandoned the dog. These are another reason why people don’t like her coming to them and saying, hey, listen, you can’t leave that dog on the deck to bark all day. That’s a criminal offense. Get something done about that. LB: I actually wanted to talk to you about the animal rescue because that is a theme throughout your books, especially with Holly. MP: Well, it has been and still is part of my life. Doing animal rescue work, you really start to hate people. MP: You know the good ones, the good pet owners and you quickly discover people that you have contempt for. For instance, I got one of my cats at a spay neuter clinic we set up, and these people came in and said, we don’t want him no more. If you don’t want him, we’re going to take him to the pound. Well, I heard that story once too often. And so has Holly. And I’ve written about those kinds of people and I’ve also written about the saints and the saviors in the animal community. 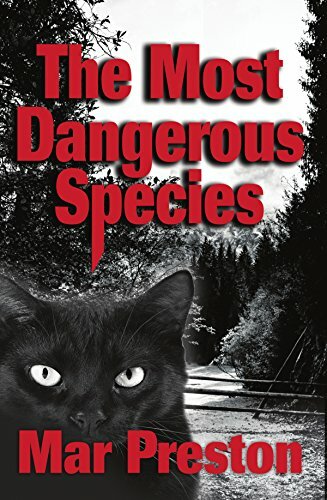 My current novel, The Most Dangerous Species, is actually set in a fictional cat rescue here in the mountain town where I live. And it’s very well-funded and operates smoothly — until there’s a murder. And I got to grind a lot of axes about animal rescue. You have to know that some of the people who do animal rescue work are crazy as loons, did you know that? LB: But their hearts are usually in the right place. LB: I was thinking how if those town meetings don’t drive you to murder, then animal rescue certainly would. MP: [Laughter] Yes! Oh, the conflicts in a village. Oh, Laura! It’s just thick with conflict here, layers of it! Overlapping social circles of people fighting with one another. I love it! I just take notes and write them down and it becomes a book. LB: Well, lucky us! Lucky us that you moved to such a thriving community. Tell me then, what is next for you? MP: What is next? Well, I have become a writing teacher. I’ve written six how-to books and they’ve been slanted towards the beginning mystery writer. They’re short and sweet, and one is on editing your first mystery, characters. One that I think is important is finishing. It’s important to finish! I know that there are lots of novels in the drawer that are potentially really interesting, good reads. But they’re not finished. So that’s an audience that I’m writing for now. And I’m doing a memoir class. You can’t sit and write mysteries all day long. LB: I want to talk a little bit about the how to write books that you’re writing. You actually have one of them available for free on your website for anyone who would care to stop by. That’s really your most basic one of how to start writing a murder mystery. MP: That’s true. Again, it’s free on my website, which is MarPreston.com, it’s very easy to find. And I hope it spurs people. We all have a unique story and a unique setting. I could never write about your life and you couldn’t write about mine, but there’s interest in everyone’s life. And how they see the world, and who’s their sleuth, who’s the victim, where is it set…? What is the chase and capture at the end? It’s all doable. Anybody can write a mystery if they apply seat of pants to chair for long periods of time. LB: Well, I loved it. I actually really enjoyed reading your how-to book, partially because I could just hear your voice as your writing it. It’s very direct and no-nonsense and very helpful. Very straightforward and helpful. So thank you for going there, thank you for helping other writers. MP: Oh, Laura, it’s fun. It’s a pleasure. LB: So, in the show notes, I’ll link to your website and your how-to-write book, but just once again for people who don’t go to the show notes, who are listening instead, how can they find you online? MP: Online, well, MarPreston.com. I’m @YesMarPreston and I have a Facebook page and my books are available on Amazon or on my website. And they’re cheap! I want more people to read them. LB: Thank you for joining me today. I really loved talking to you, Mar. MP: Oh, Laura, I look forward to seeing you at our next mystery conference. Thank you, Laura, for making me sound coherent. I love talking about the dark and mysterious.